The U.S. Geological Survey (USGS) has selected Dewberry, a privately held professional services firm, to collect and process Quality Level 1 topographic lidar data of Puerto Rico, including the islands of Culebra, Vieques, and Isla de Mona; and the U.S. Virgin Islands of St. Croix, St. John, and St. Thomas. The new data will be used to identify the impact of Category 5 Hurricane Maria, which struck the territories in September 2017. The project will be completed under Dewberry's Geospatial Product and Services Contract with USGS to support the 3D Elevation Program. Dewberry has been performing mapping, mitigation planning, and sea level rise studies in Puerto Rico for more than ten years, primarily serving the Federal Emergency Management Agency (FEMA). In a similar effort, the firm recently collected and processed more than 3,400 square miles of topographic and bathymetric lidar data for USGS, the National Oceanic and Atmospheric Administration (NOAA), and the Commonwealth of Puerto Rico. For that project, the data were collected prior to Hurricane Maria's landfall, and the new data will be assessed in comparison to that dataset to evaluate the storm's impact. Lidar data have not been collected for the U.S. Virgin Islands in more than ten years. The new lidar data will be collected, processed, and delivered by the spring of 2019. Dewberry will perform all ground surveys and its geospatial team will complete the processing and creation of digital elevation models and other ancillary products. The firm's subconsultant, Leading Edge Geomatics, will perform the data acquisition using two Riegl VQ1560i sensors. 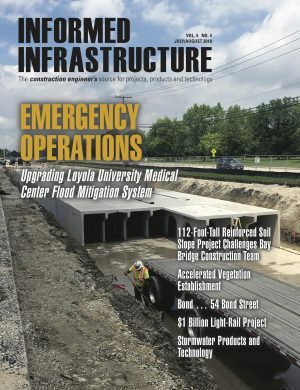 "The pre-storm data we had collected and processed under our prior task order was instrumental in assisting FEMA, its partners, and the local Puerto Rican government in planning and conducting its post-Maria disaster recovery work," says Amar Nayegandhi, CP, CMS, GISP, vice president of geospatial and technology services for Dewberry. "The new data are being collected at a higher density to also support the infrastructure community and will show how the storm has altered the terrain."